Whilst reviewing recent ISIS media coverage I discovered that there's another 'celebrity truther' out there. Naomi Wolf, a former Clinton groupie! 'The NYT (New York Times) yesterday ran a depressingly sloppy editorial claiming that all the ISIS beheading videos must be real because 'there are so many of them on youtube'. Social media users quickly rounded on her with some suggesting her theories were 'crazy' while others said her views were 'harmful' and had disrespected the victims' families. Like many other journalists who cover the Middle East, I had previously met both murdered American journalist James Foley and his parents (in my case, in 2011) and can attest, although I deeply regret that it is necessary to do so, that they are not actors. When Naomi sold her soul to the oil sheikhs of Qatar, Great Mother Gaia, who knows all, officially registered feminism as a dead parrot. This time Naomi was selling out to the biggest propaganda channel in the Arab world, Al Jazeerah. No dollar figures were mentioned when Naomi sold out, but world famous radical feminists don’t come cheap. In recent days, she’s propounded the following: that US forces’ involvement in combatting the Liberian ebola outbreak is just a convenient front for the militarisation of Africa; that the Scottish referendum was fixed; that hostages executed by Isis are neither hostages nor executed nor anything to do with Isis, but performers enacting a shoddy tableau for the purposes of terrifying an unquestioning Western populace into docility. 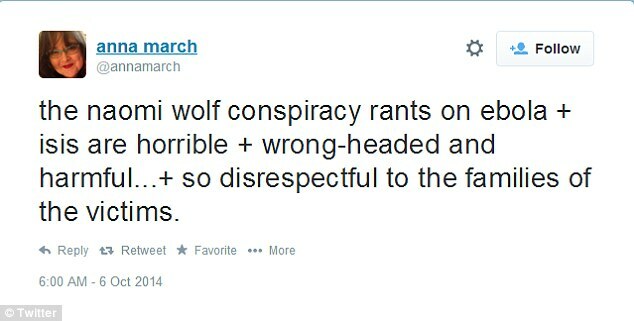 In fact, Wolf’s suggestions follow the rough outline of several persistent and, frankly, heinous conspiracy theories floated after the massacre of school children in Newtown: The whole thing was faked, the footage was altered, and the mourning were simply actors, their grief an insidious ploy. After the Kennedy assassination, every conspiracy was a cover-up. There was the official story, strung together from sparse and disputed “facts,” then there was everything else, not yet known, but waiting to be uncovered. Who exactly was on the grassy knoll? How many shooters were there? Who were the three tramps? Even the notion that the moon landing is a hoax, which relies on the idea of faked footage, is essentially a conspiracy predicated on a dearth of evidence: We have only one account, so why should we trust it? It’s a conspiracy theory precisely tailored to the modern surveillance age. Sure, there’s actual video footage of the atrocity being committed, but guess what? The footage is fake. And the news reports detailing the crimes? Bogus — the reporters are in on it, too. And all those real people, filmed from a dozen angles, who were clearly left emotionally ravaged? Actors, every single one of them. * Perhaps this is all that is being pushed... if you question 'reported events' then you'll receive a 'backlash' and/or be allied with Clinton-era feminists? The thing with a world full of delusion & deception is everyone is so easily fooled... from Chinese factory slaves through to 'illuminated Professors'. I bet the guys faking the Nuke movies thought they were doing it to cement a 'world peace'... and in a way weren't they? Perhaps she has bought into the optimism angle of the truther movement (we just need to elect Ron Paul... then everything will be fine again) or even the 'expel the parasite' wing (we just need to get rid of the Zionists... then everything will be fine again). Either way it is simple to see how her words are being used by the media to push their own agenda's. hoi.polloi wrote: Her books, the ones like Shock Doctrine, are legitimate investigations into Ford Foundation funding and the surface-level politics of the super class in power. But she only goes as far as pointing to the financial corruption and contradictions in the official democratic system. Whoopsie, that's Naomi Klein you're thinking about, Hoi ! "The Shock Doctrine vividly shows how disaster capitalism – the rapid-fire corporate reengineering of societies still reeling from shock – did not begin with September 11, 2001." "Immediately following September 11, the Bush Administration quietly out-sources the running of the “War on Terror” to Halliburton and Blackwater…. After a tsunami wipes out the coasts of Southeast Asia, the pristine beaches are auctioned off to tourist resorts.... New Orleans’s residents, scattered from Hurricane Katrina, discover that their public housing, hospitals and schools will never be reopened…. These events are examples of “the shock doctrine”: using the public’s disorientation following massive collective shocks – wars, terrorist attacks, or natural disasters -- to achieve control by imposing economic shock therapy. " Woops! Looks like I can't keep these Naomis straight. Aye aye aye. So there's another Naomi talking about conspiracies as completely legit? My bad. I guess I had heard of this Naomi Wolf but never knew what they did. Yes, thank you Simon, I was thinking of Naomi Klein. I must reserve judgement on Naomi Wolf, despite Critical Mass' interesting points because now I realize I haven't actually personally read anything from this person and subconsciously, I clearly had some urge to rant about Klein. Sorry folks. Duuuh. Please move on, ignoring my ridiculously lengthy derailment, which will now quietly be shuffled into the DERAILING ROOM. Naomi Wolf in sheep's clothing I wonder if she subscribes to Fabian Socialism. What is the Fabian society anyway? I have heard this term bandied about but is anyone surely a part of it? hoi.polloi wrote: What is the Fabian society anyway? I have heard this term bandied about but is anyone surely a part of it? Named after Roman general Fabius "Cunctator" who fought Carthaginians by dodging them and delaying direct confrontations. Fabians claimed/claim(?) to follow the same tactics fighting for socialism . Labour Party for example comes from Fabian Society. From my understanding it's related to the eugenics movement and is affiliated with the Labour party. Notable members have included: H.G.Wells, George Bernard Shaw, and Tony Blair. The highly curious, even grimly compelling narrative of Ms. Wolf's public metamorphosis from loose-cannon feminist to conspiracy theorist (of the rara avis media-fakery breed) should not be dismissed, but rather savoured. Even if it's merely a scripted drama (which so far I doubt, chiefly because of its messiness) it ought to be high on our entertainment agenda. For a such a high-profile, successful author/Jewish princess as this to stride (or is it creep) ever closer to the edge of the UTTERLY VERBOTEN abyss of calling out "Fakery, fakery, thy name is fakery!" to the very mass-media organs (wholly owned/controlled by her tribe) that once annointed her very pretty head with fame and fortune -- seems much more likely a career-death wish than an assumed pose in some not-so-arcane dialectic. If she's for real, I applaud her. If she's only acting a part -- it's (so far, to me) a convincing one. "Conscience doth make cowards of us all." Hat tip to "Brugga Jugga", the sharp-minded maker / commentator of this video. Fakery is getting traction: I see it here and there. What are they going to do? They'll try to get in front of it, of course. So we have Facebook (or was it Youtube) introducing a way to flag news as false, this thing here with Naomi Wolf etc ... we'll be seeing a lot more of it soon, I'm sure. They're very predictable and formulaic with things like this. And I don't think they have thought this one through all that well, if this really is the path they're taking. edgewaters wrote: Fakery is getting traction: I see it here and there. What are they going to do? They'll try to get in front of it, of course. The Nutwork ALWAYS tries to 'get in front of it', as you say. It is their obligatory MO (Modus Operandi). They constantly need to upgrade their CO (controlled opposition) gatekeeping cells - manning them with their own, tailor-made, 'specialized' agents. Is Naomi Wolf yet another such 'cutting-edge' agent? Let us wait and see. To be sure, she wouldn't be the first such 'cutting-edge' gatekeeper. For instance: the Ace Baker clown (presented / cast as a "CGI expert") was, of course, one of them. He was rolled out by the 'well-established' Fetzer gatekeeping cell - in order to 'get in front' of my September Clues research, for damage-control purposes. The Ace Baker gatekeeping operation was partly successful insofar that it made him appear (to the casual viewer) more proficient / and professional than myself in the field of CGI imagery. As you know, Ace Baker's 'final conclusions' (promoted with the slick, big-budget PSYOPERA movie) went roughly like this: "ONLY the planes were inserted into otherwise authentic imagery of Manhattan filmed by the various TV camera crews". "Animating the demolition videos to the level of realism depicted is impossible, even with 2014 technology. " Lol. That is tantamount to saying that all modern Hollywood / CGI-packed action movies are impossible... and do not exist !